Be the first to share your favorite memory, photo or story of Zane. This memorial page is dedicated for family, friends and future generations to celebrate the life of their loved one. 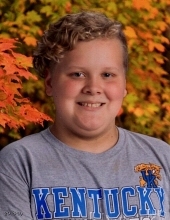 Germantown - Zane Wyatte Ballard, 11, of Germantown, passed away Tuesday March 26, 2019 at his residence. Zane was born March 8, 2008 in Maysville to Jessie and Jennifer Shields Ballard. He was a 5th grader at Taylor Elementary in Bracken County. In addition to his parents, Zane is survived by his sisters, Zoe Ballard and Diana Sartin; his maternal grandmother, Cherie (Jerry) Dean; his maternal grandfather, Rick Shields; his paternal grandmother, Emma (James) Watkins; uncles, Sam (Gwen) Ballard and Justin (Tasha) Dean; his aunts, Heather Shields, Megan Shields and Jamie Sheehan; maternal great-grandmother, Eva Dean: and a several cousins. He was preceded in death by his paternal grandfather, Sam Ballard. Funeral services for Zane Ballard will be held at 1:00 p.m. Tuesday at Brell & Son Funeral Home with burial to follow in Hillcrest Garden of Memories. Visitation will be on Monday from 5:00 to 8:00 p.m. at the funeral home. To send flowers or a remembrance gift to the family of Zane Wyatte Ballard, please visit our Tribute Store. "Email Address" would like to share the life celebration of Zane Wyatte Ballard. Click on the "link" to go to share a favorite memory or leave a condolence message for the family.